Ryan Slobojan and his daughter, Elizabeth, drove from Pickering, Ont., to Ottawa to bring candles to a vigil marking two years since a deadly attack at a Quebec City mosque. In a hotel room in downtown Ottawa, Ryan Slobojan and his daughter, Elizabeth, carefully attach printed messages of support to 320 LED candles. The two travelled to the capital from Pickering, Ont., on Sunday with a plan to hand out the bundles at a vigil on Tuesday night, one of many being held across the country to mark the second anniversary of a deadly shooting inside a mosque in Quebec City. "The idea behind the candles is they're a symbol of the ability of the light of knowledge and friendship to push back the darkness of ignorance and hate," said Slobojan, founder of Push Back the Darkness, an initiative that aims to shine light on the impacts of hate and ignorance. The software developer distinctly remembers the night he learned six men had been shot dead while praying inside the Centre culturel Islamique de Québec (Islamic Cultural Centre of Quebec). "I could not believe that something like that could happen here in Canada," he said. "I knew I had to take some kind of meaningful action." The next day, Slobojan picked up his daughter at her school bus stop and went to the nearest mosque in Pickering. They brought with them a cardboard sign bearing the simple message, "free hugs." Having never been to a mosque before, Slobojan said he was nervous about scaring people — especially the day after the Quebec City attack. But he said their gesture was warmly received as he and Elizabeth greeted people at the building's entrance. "I don't think I'd ever seen such large smiles on people's faces," Slobojan recalled. Slobojan said it was important to him that his daughter was there to learn about the diversity of her community. Elizabeth, now 7, recalls having a good time greeting people at the mosque that afternoon. "I felt really, really good and happy because giving hugs is a nice thing to do... and it makes them feel more safe," she said. On the one-year anniversary of the shooting, Slobojan sent candles to that same Pickering mosque. He was inspired by a famous quote from Martin Luther King Jr.: "Darkness cannot drive out darkness; only light can do that. Hate cannot drive out hate; only love can do that." 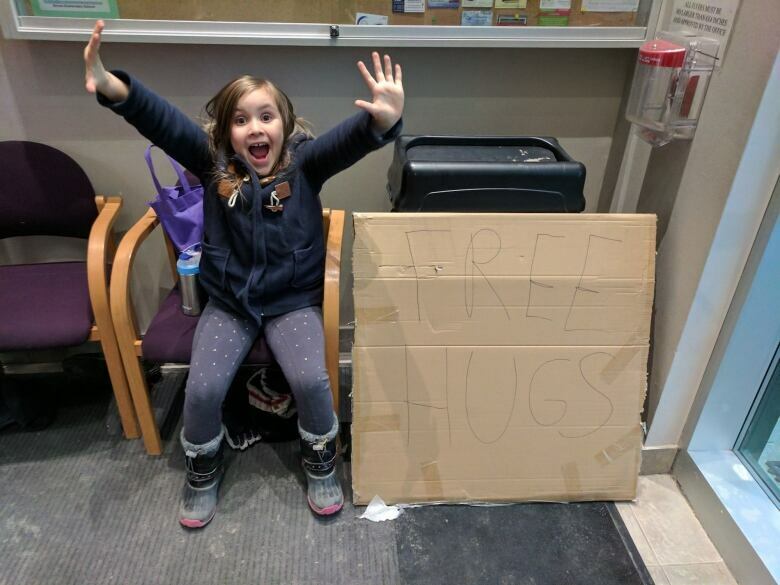 Since then, Slobojan and his daughter have continued to reach out to the Muslim community, most recently with a train trip to Quebec City last week, to give more free hugs at the the very mosque where the attack took place in 2017. There, they met three men who survived the shooting. "From this friendship and seeing how warmly we were welcomed, it helped me realize how important it is to take action. I'm hoping to inspire others to do similar things," Slobojan said. A vigil marking the two-year anniversary is planned for Tuesday at the Centennial Flame on Parliament Hill, beginning at 5:45 p.m.
Salma Mahgoub is an associate producer with CBC Radio and a freelance journalist based in Ottawa.